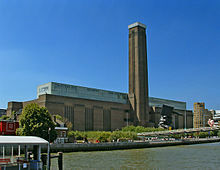 Tate Modern is a modern art gallery located in London. It is Britain's national gallery of international modern art and forms part of the Tate group. Tate holds the national collection of British art from 1900 to the present day and international modern and contemporary art. This article uses material from the Wikipedia article "Tate Modern", which is released under the Creative Commons Attribution-Share-Alike 3.0 License.